TAS News Feed Traveller related news and information. Anyone may post new Traveller related news, but all new threads are moderated for approval before being displayed. 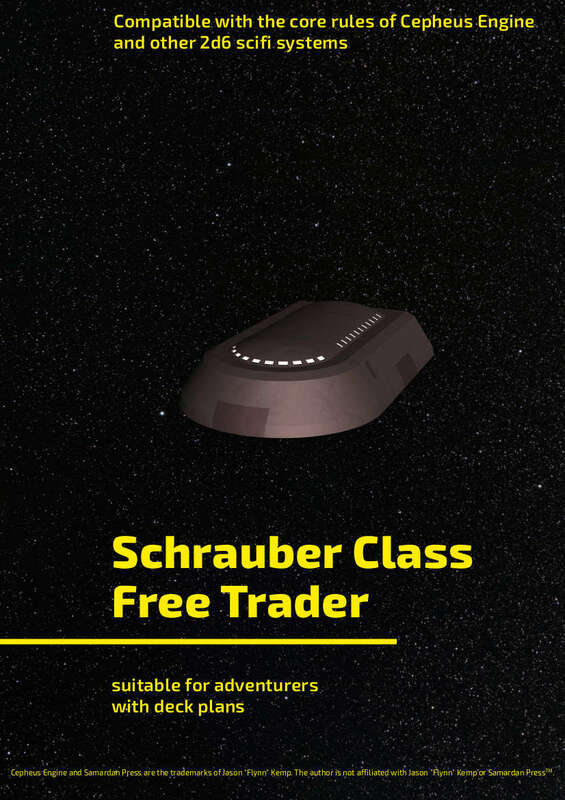 The Schrauber class is a 300 dton jump-2 free trader, designed for a crew of 5 and 8 passengers. It is suitable for a group of space travellers or their adversaries. This document contains three different versions of the Schrauber, the standard version, a more rugged frontier version, and a q-ship version. Each one comes with a short description, full stats for the Cepheus Engine and detailed deck plans. Bought it, and it looks very good. Clean and quite useable. I like the unobstructed cargo space. My only comment is you could use a bit of supply storage, but that is minor and more me. Regarding supply storage: There are cupboards, closets and lockers in the common room and the galley, of course. But something like a 1-square pantry would be a logical detail to add.